TORONTO, Sept. 9, 2015 /CNW/ - No 99 Wayne Gretzky Collection has arrived at Sears Canada. This new line of better casual clothing, exclusive to Sears Canada, will keep men looking neat, handsome and fashionable this Fall. "We are excited to bring the Wayne Gretzky Collection to our customers, with its mix of classic pieces and rich fabrics," said Brandon G. Stranzl, Executive Chairman, Sears Canada. "Partnering with Wayne Gretzky, the world's most famous hockey player and a Canadian icon, is part of our strategy to make Sears a destination for shoppers to outfit their lives with brands they love. With Sears nationwide network of stores, sears.ca and the catalogue, this collection of menswear will be accessible to Canadians coast to coast." Mercerized cottons, cashmeres and merino wool give this collection a luxurious feel, offering men a complete look. The 100% double mercerized cotton polos are available in numerous colours, at $49.99 while the long-sleeved 100% cotton shirts come in a variety of patterns, including plaid, printed and checked, retailing for $69.99. The 100% cotton t-shirts, starting at $24.99, bring a casual look to any outfit, while the knit jackets, starting at $159.99, dress things up. Pants, starting at $79.99, sweaters, starting at $79.99, and hoodies, starting at $49.99, complete the collection. The clothing is now available at all 95 Sears department stores, online at www.sears.ca and in the 2015 Sears Wish Book. 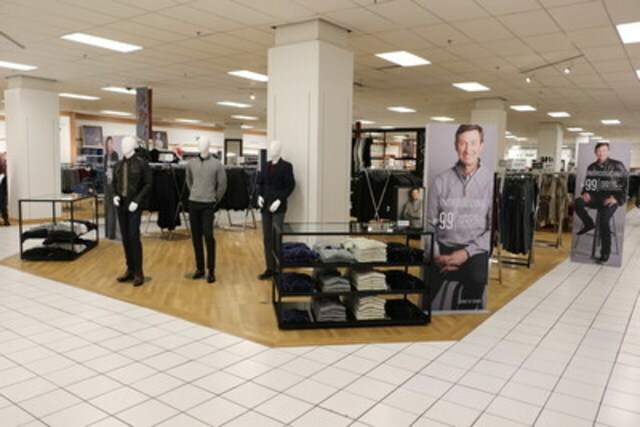 25 Sears department stores feature a Wayne Gretzky Collection branded shop, representing dedicated space with fresh, branded fixtures to feature the merchandise. No 99 Wayne Gretzky Collection will be part of World MasterCard Fashion Week this Fall, with Sears Canada hosting an event on October 22. The 2016 Spring/Summer Wayne Gretzky Collection will be featured. "Sears got my style down when they created this collection," said Wayne Gretzky. "I had the opportunity to wear all the pieces, from the t-shirts and sweaters to the jeans and dress pants, and the style, quality and value is excellent. I thoroughly expected it was going to be good, but I didn't know it would be this good." Sears Canada is a multi-channel retailer with a network that includes 166 corporate stores, 177 Hometown stores, over 1,200 catalogue and online merchandise pick-up locations, 84 Sears Travel offices and a nationwide repair and service network. The Company also publishes Canada's most extensive general merchandise catalogue and offers shopping online at www.sears.ca.